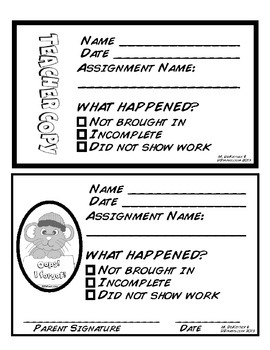 This missing homework slip is a two part sheet for keeping a record of work turned in late, incomplete, or without showing work. The top half is filled out by the student and returned immediately to the teacher. The bottom half is taken home to be signed by the parent and brought back the next day. When the bottom is brought back, teacher staples both parts together and keeps on file for conferences. Sheet contains spaces for name, date, assignment, and parent signatures. Also contains a checklist of what was wrong with the assignment (incomplete, work not shown, or not brought in). Also features a cute little cartoon mouse holding a sign that reads, "Oops! I forgot!"